Clean stove technology is an urgent environmental challenge. Every year, more than four million people around the world die of causes related to indoor air pollution and burns – the result of cooking over open fires using wood or charcoal fuels. Three billion people still rely on leaves and stick campfires to prepare their meals every day. Inyenyeri produces the cleanest biomass cookstoves in the world. The company offers customers two of these cookstoves for free. This gives families 2 burners so that they don’t need to supplement with a second open fire. The families can then purchase low cost, ground wood fuel pellets locally made for this clean burning stove design. Or they can simply take their collected twigs and fiber to the factories in return for cash. There have been many clean stove initiatives, but this one has been validated by its successes and has received grants and carbon credit from IKEA and the World Bank. It’s now expanding all over the countryside. We are also partnering with Kiva.org to promote micro-loans, for $50,000 each. 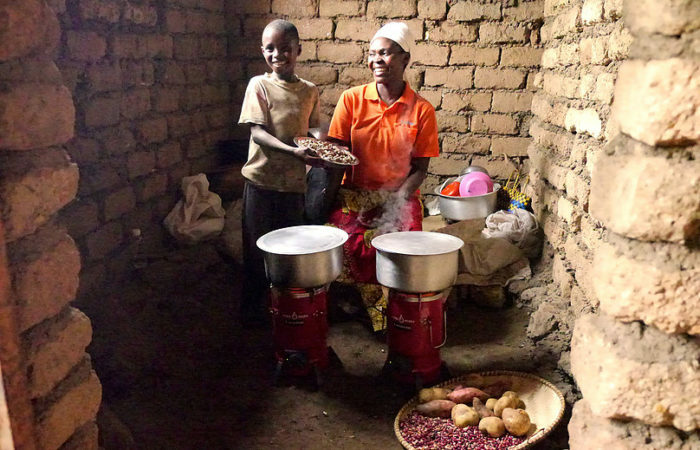 This program supplies 2 cookstoves to every household in a typical Rwandan village of 500 families. Loans get repaid from pellet purchases and this carries forward into stoves and factory for the next township. Ideally, we will soon see developing countries successfully combatting cookstove pollution and breathing clean air. Perhaps even before developed countries have conquered the smog issues from transportation and energy challenges. For more information, please check out their website Inyenyeri.org.